So I’m going to try a new addition to the blog. Before moving to London, I had bought an apartment in the Roger’s Park neighborhood of Chicago. It’s the farthest north neighborhood in the city. Coming back after a 3.5 year hiatus, I find myself looking at it differently. I’m curious about the history around it and so I thought I’d try a little bit of educating myself about what’s around here. It ceased to serve a religious purpose in 2002, around the time I first moved to Chicago, so it’s not been a house worship for a decent chunk of time. But, it’s a beautiful building on the outside. As Roger’s Park was absorbed by Chicago, it began to grow along with the rest of the city. Among the new groups of people arriving in the area was a decently large sized Jewish community. It peaked at around 20,000 Jews after WWII. 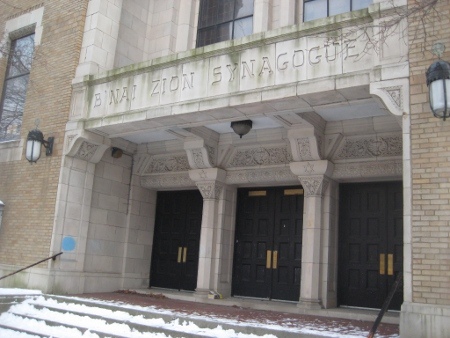 B’nai Zion was the first Conservative Jewish synagogue in Chicago and this building opened it doors right before the Great Depression. It’s quite large, the picture above is only about half of it (there’s a second section to the right). This is the main entrance to the building showing some of the nice decoration. After WWII, Chicago began a slow decline and Roger’s Park began to see the changes as well. The Jewish population moved to the suburbs and the need for a synagogue in the area became less important. There is still a rather large orthodox community, but they live in points west of East Roger’s Park. The end finally came in 2002, when B’nai Zion merged with another synagogue and took up residence in a different home (at least that’s the address they advertise). 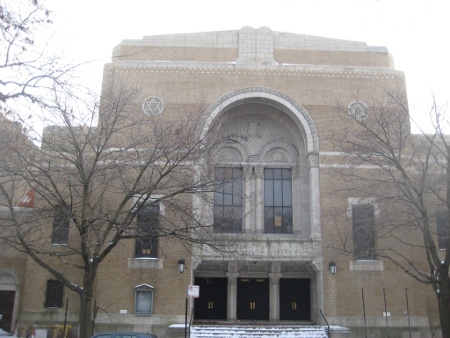 The synagogue has been replaced by the Lake Shore Schools, so it’s still able to serve the community, just in a different way. Roger’s Park has seen a lot and been through a lot of changes over the years. This building simply stands as evidence of one of those waves of people who came through, established a community here and was replaced by other groups. This entry was posted on Saturday, January 15th, 2011 at 5:11 pm	and is filed under Chicago, Photos, Rogers Park. You can follow any responses to this entry through the RSS 2.0 feed. Both comments and pings are currently closed. 64 years since Hershel Oliff was first licensed to practice law in IL. So here’s a question….do you know if the guts of the main building are still in place? The grand staircases or any of the stained glass windows (can you spot those from the back/alley)? Maybe you could knock on the door of the school and ask to see that part of the building? I was thinking of asking the school if I could take a look inside. The other bit of the building has windows you can see from the street and it’s all done up for a school. No idea what the main part of the building is like, though. hey … yes more pisctures of things i need to come aad see!! If you get to look inside may be you can take some more photos. Entries (RSS) and Comments (RSS).22 queries. 0.320 seconds.